Did you know there are government incentives that help you save big with solar energy? The Sundog Solar team can help you take advantage of this great cost-saving opportunity! Sundog Solar also offers financing for residential and small commercial solar systems. There is a generous federal tax credit that lowers the total cost of a renewable energy system by 30%. This money-saving opportunity is available for both residential and commercial solar energy installations in Maine. Grid-tied, hybrid, and off-grid photovoltaic solar systems qualify. Tax credits are a dollar-for-dollar reduction in income taxes owed and are therefore more valuable for the taxpayer than a write-off. Qualified expenses include the cost of the solar panels, inverter, components, and labor. Installing a solar system on your home can qualify you for the Solar Investment Tax Credit. For example, if you install a $10,000 solar system, the tax credit would reduce the total net cost of the system by an estimated $3,000. Speak with your tax specialist to determine if you qualify. The Solar Investment Tax Credit will begin tapering off in 2020, so now a great time to invest in a clean energy system for your home! Solar energy customers that are connected to the power grid can be credited for the surplus solar electricity that they feed to the power grid. This is called net metering or net energy metering. For example, many solar households generate more solar electricity than they consume on sunny days. If the system doesn’t have batteries, all this electricity goes to the power grid and you will receive credits. Many Sundog Solar customers pay only the monthly connection fee to the electric company. Such homes are net zero which means that the solar panels generate all the electricity the household consumes over the course of a year. The price of solar energy has declined significantly in recent years for both residential and commercial systems because the cost of solar panels and other components has plummeted. Meanwhile, equipment efficiency has improved and electric rates have increased considerably. This means solar systems pay for themselves in savings even faster. The price of your solar energy system will depend on how much electricity you need, the solar equipment installed, and how the solar panels are mounted. Pole-mounted solar systems cost a bit more to install than many roof-mounted systems but can have significantly higher power production depending on the circumstances. The Sundog Solar team begins sizing your PV system by looking at your electric bill to determine the total amount of kilowatt hours used. If you provide this information to one of our solar experts, we can estimate your solar system cost and potential savings. The size of your solar energy system will also be influenced by the amount of roof space, how much of your energy bills you would like to eliminate, and your project budget. 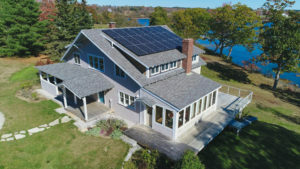 Net Metering allows utility customers to save money by earning credits for each kilowatt-hour of electricity they produce above their monthly energy use. Energy credits are used during lower production periods and are good for 12 months. Customers pay a minimum monthly utility charge and have access to utility power when needed but will not be reimbursed for unused credits that expire each year. At Sundog Solar, we understand that proper solar system size is very important. We make meticulous calculations using historical Maine weather data to ensure that you are getting the greatest value out of your solar PV system. 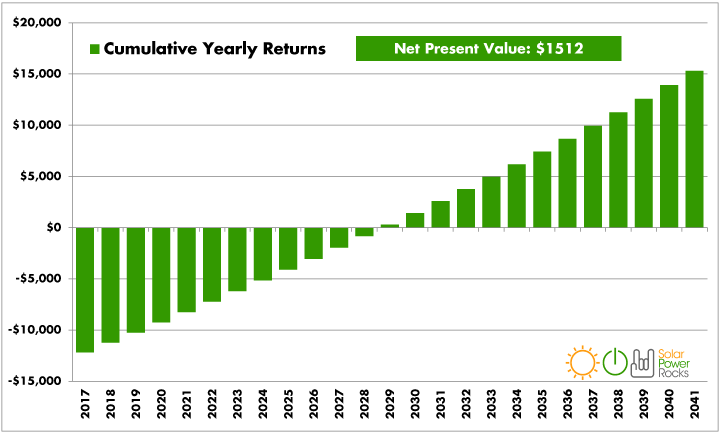 Here’s a simple ROI for a grid-tied PV system that was purchased with cash. The typical payback period is eight to ten years with many years of free energy after that. With years of experience installing solar energy systems and heat pumps throughout Maine, Sundog Solar has a strong reputation for excellent customer service and quality workmanship. We are small enough to give each job a personal touch, yet large enough to have a wealth of solar energy experience. We are dedicated to helping Maine families and business from Portland to Augusta, Bangor, Bar Harbor, and beyond to go solar. The Sundog Solar team uses some of the most reliable equipment on the market, including SMA, Schneider Electric, Pika Energy, LG, Solaria, and SolarEdge products. We work as a team to truly serve our customers and get the job done right!